Courage is an ancient philosophical virtue. Some people are surprised by this fact. Philosophers, in the public mind, are forever associated with petty debates far removed from the hot-blooded concerns of life. When we think of philosophers, we imagine fusty academics puzzling over questions like: ‘How long is a piece of string?’ – not stalwart, heroic, types brimming over with courage and forbearance. Yet courage was an essential philosophical virtue in ancient times. Socrates and Aristotle affirmed this virtue, and other philosophers echoed the idea. Philosophers were made of sterner stuff in the ancient world. Philosophy wasn’t just an education in ideas. It involved a rigorous personal training aimed to free us from false ideas, and to prepare us for whatever hardships life could throw our way. It takes courage to look life in the eye and make it the best it can be. It takes resilience too. To walk a courageous path, one can be forced to abandon the creature comforts that one takes for granted. Fortunately, one of the benefits of philosophy is that it teaches us how to live with a minimum of comforts and possession. Diogenes demonstrated this to Alexander by rejecting his offer of help. The sun would suffice, Diogenes implied – this and the opportunity for honest reflection. 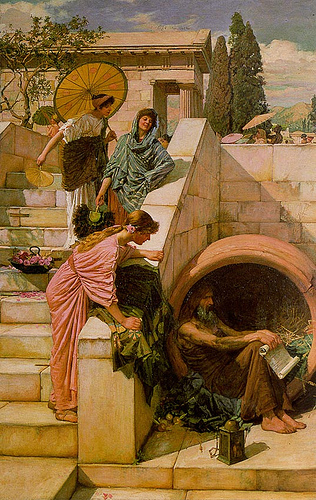 In our age of ‘luxury fever’ and ostentatious wealth, we would do well to follow Diogenes’ example, and learn how to live with minimal possessions in peace and dignity. I really, really like the bit about philosophy providing ‘rigourous personal training aiming to free us from false ideas’. Ideas are all in our ‘minds’ – and sadly – ‘honest reflection’ a way of the past. Thanks for your blog. Best, Debra. Although I love the precedents left by Diogenes and other thinkers like him, I’m afraid I feel it’s not enough to learn and read about ways to live in simplicity. For one, I don’t think any type of change should collective, because collectivism implies that the choices made were not of an individual choice – but coerced instead. Second, I think people should discover the pathology which make them quantify and desire near self-destructive or myopic lifestyles. There is the fear and preoccupation of mortality which stifle many people from acting of their own accord and reason as Diogenes did.